This bank holiday weekend sees the good people at Real Nice take over London’s cavernous Pulse club on the banks of the River Thames for a monstrous early summer party. 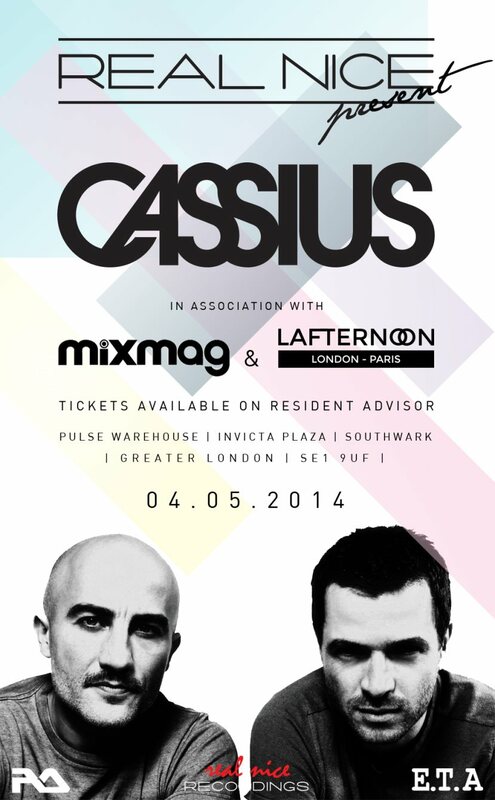 They’ve teamed up with plate-spinning bible Mixmag and Anglo-French party people L’Afternoon for a Sunday night extravaganza that sees pioneering French house outfit Cassius perform their first London show for three years. Cassius have produced for a huge range of artists over the past 20 (yes, 20) years, from Kindness and Phoenix to MC Solaar and Drake – alongside creating eight albums of their own. And the Ed Banger duo are also responsible for the original tracks behind two of our favourite remixes of recent years (in ‘The Sound of Violence’ and ‘I Love You So’). It looks like a lot of fun and, best of all, we are offering you the chance to go for free. Hooray! We estimate it will take between three and five seconds to enter, so head to our Facebook page and get involved. Little late to the party on this one. Dev Hynes aka Blood Orange has commandeered the New York duo A/JUS/TED to provide an alternative offering to his track, ‘Uncle ACE’. The tune just about hits nine minutes in length, and in no way is that a bad thing. It’s drawn out, perfectly measured and the gradual build up works nicely with Dev’s forlorn vocals. The original’s worth a gander too. Bicep return to Will Saul’s AUS Music with the infectious banger that is ‘NRG106’. The tune joins ‘Circles’ on the EP of the same name and is sure to liven up your afternoon. Yours to buy from 26th May. FINALLY. The new Jacques Greene EP, ‘Phantom Vibrate’ is out, on Glasgow’s finest, LuckyMe Records. The almost-Gospel like ‘Feel What’ was uploaded yesterday, joining track number one from the EP, ‘No Excuse’ – a heart on the sleeve slice of future RnB. Both below, grab the EP here. The newest members to join the PMR Records family? South East London’s Ryan Ellis and Lewis Wright, aka No Artificial Colours. London-based KHUSHI released his (their?) debut EP back in early March via London-based label Laissez Faire Club, and this gem of a track ‘In The Sun’ surfaced online a few days ago. With its flawless vocals, controlled drumming and hazy soundscapes, it’s got the makings of a wonderful pop song. Be sure to give him (them?) a like on Facebook to stay tuned. Head here to purchase the thing. While we’re on it, London beatsmiths Toyboy & Robin have had a go at this one by HTDW too. WG’s edit adds a killer 90s edge to the pop sensation’s next release – it’s sure to get multiple plays, especially after the success of his debut single, ‘Stronger’, which was released on March 24th on Polkadot Recordings. Being the debut release for the label too, the future’s looking bright for the lot of them and we’re big fans of what they’re doing. Not only has the Black country label head Sam Bevan been producing himself for a while as Polkadot, but each release on the label will see a different artist designing a limited edition T-shirt to accompany the tune. And we must say, the design for ‘Stronger’ is looking very tasty indeed. Tourist continues to deliver with his recent collaboration with Lianne La Havas. Joining ‘I Can’t Keep Up’ and ‘Together’ (one of the standouts of 2013, for us), ‘Patterns’ is the title track from his brand new EP, out on Disclosure’s Method Records. Once again the London via Brighton producer is doing what he knows best – drawing the listener in subtly before a steady build up to the emotionally charged climax. It’s a tried and tested recipe from his more recent releases, and in turn he’s carving out a strong reputation as one of the UK’s most promising producers. Recruiting another celeb for the vocals, (a tip from the label heads perhaps) can only help the matter – Lianne La Havas sounds well at home with the swirling synths and scatty percussion. Her input, combined with the gospel-tinged chorus, make this tune very radio-friendly indeed. For a change of tempo, check out Tourist’s recent remix of London Grammar’s ‘Sights’, and for a longer stint, his recent guest show on Rinse FM. We’ve got it ALL covered.